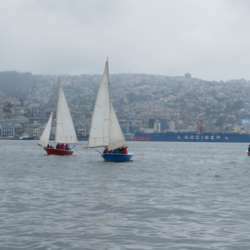 You must be a member of the Santiago de Chile Sailing Group to attend this activity. Would you like to join this group? We have 4 boats. Each one with 1 experienced Skipper and 4 crew not necessarily experienced sailors who has to obey the Captains orders… mutiny is not permitted. We race a real regatta with a starting line, a track race with buoys, an on the water race committee, rescue speed boats, and 4 anxious Captains eager to win the race. Participants should contact via Private message others participants to coordinate carpooling. If you are driving please post it and how many spots you have in your car. This event does not have a guaranteed Carpool. Captains and crew meeting for rules and racing explanations. 16:00 Meeting at a Restaurant and Prize giving to the crew of winning boat and second place. Then we have lunch and drinks. Bank Data for transferring or depositing will be sent to participants. Just signing in does not get you on the crew list. To be on the crew list you have to transfer or deposit the Racing fee. The racing Fee is $ 20.000 per participant. NON REFUNDABLE. If later you can’t come, we will make our best efforts to offer your place so you can get your fee back. The Racing Fee covers the rent of the Club facilities, the Sailing Boats, the Race committee boat, the support boat, the Buoys, the Club Staff, all we need to race the regatta.